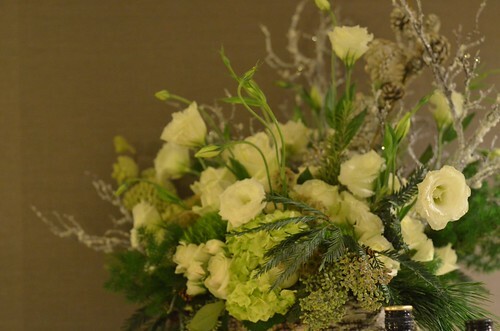 For the third year, I had the extreme pleasure of creating florals and other decor for my favorite client's company Christmas party. 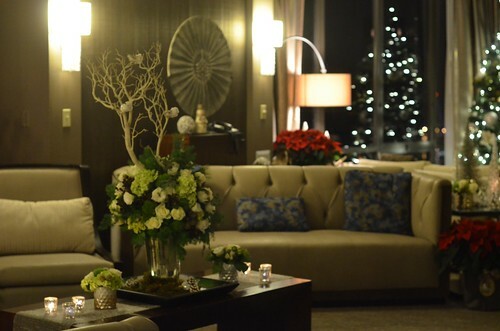 The event is held each year in the Presidential Suite of the Seattle Westin Hotel. It's a gorgeous room with an incredible view of downtown Seattle. From the suite you can see the Macy's star and all the twinkling lights of Seattle's shopping core, the neon sign of the Pike Place Market, the waterfront, the ferris wheel, the Monorail, and even the Space Needle! It's truly a spectacular sight. 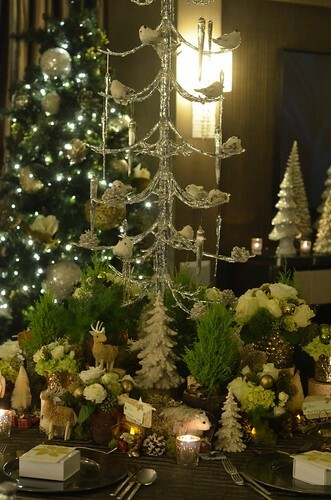 The suite decor is lovely and modern with earth tones and metallic accents, which made the perfect backdrop for a natural and sparkly holiday display. Normally the guests are all seated at one large table, but this year the guest list expanded so we needed to split the party and set two tables. 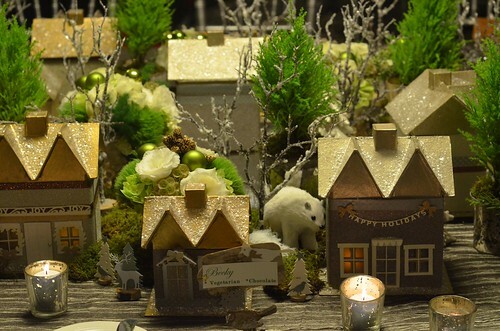 For the larger square table, we used the houses I created for last year's party in the tablescape, but the look was very different. Last year we mixed whites with the gold and silver houses and the look was uniform and crisp. 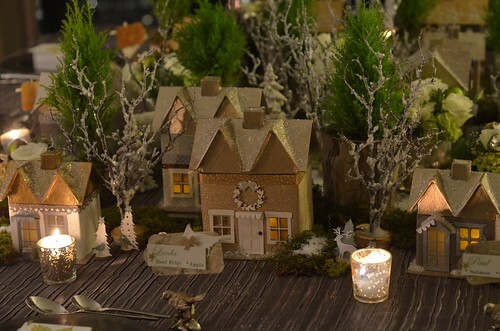 This year, moss, critters, bare trees and earthier elements were added, and the scene felt more woodsy and rural. 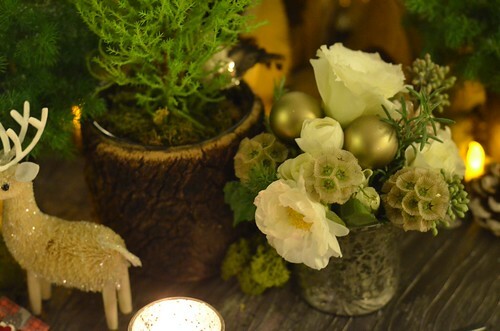 Lime green Lemon Cypress trees were potted in birch and ceramic containers and placed around the table. The bright green made the golden rooftops glow. 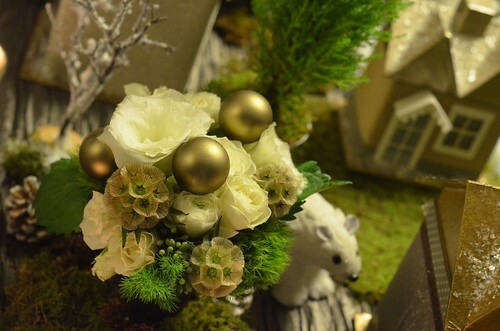 Small, dense floral arrangements of spray roses, lisianthus, scabiosa pods, ranunculus, and moss green dianthus were placed between the trees and houses. Critters hid in the scene. Strips of sheet moss softened the tabletop. Faux votives were tucked inside the houses and gave them a warm glow. Frosty trees completed the landscape, and snow dusted the whole scene. The linens were a shimmery, pleated, chocolate brown. 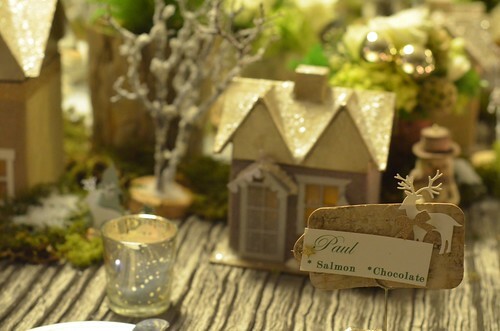 The place cards were cut from birch paper. 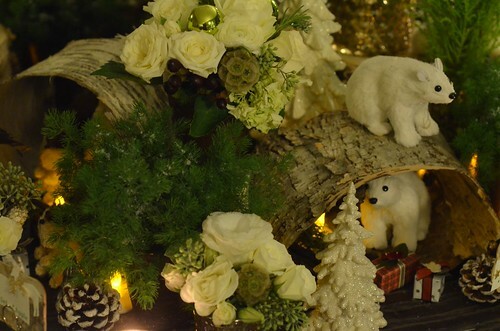 There were many details for the guests to discover. 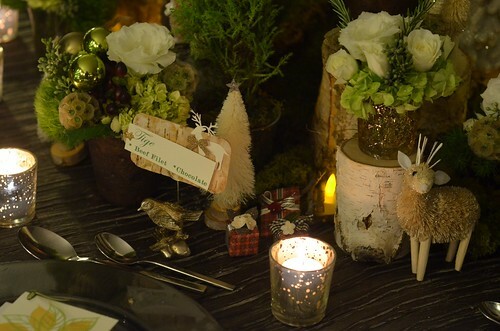 For the second table, the scene was wintery and woodsy. 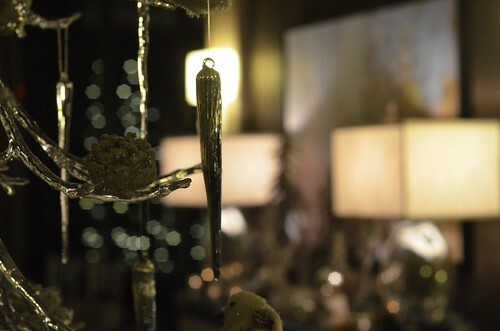 In the center, stood a tall acrylic tree dripping with mercury and clear glass icicles. 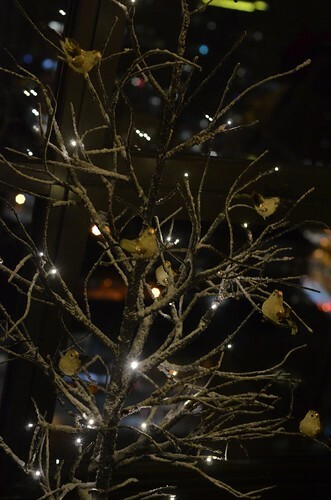 Birds rested on the branch tips. 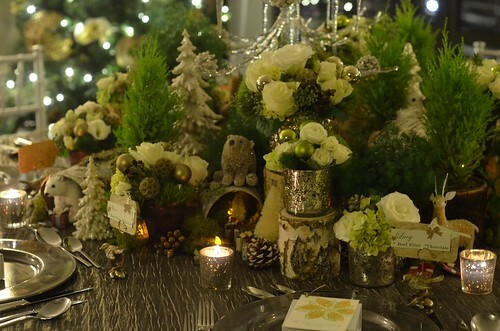 Lemon Cyprus trees and many layers of flowers, moss, and birch surrounded the glistening tree. 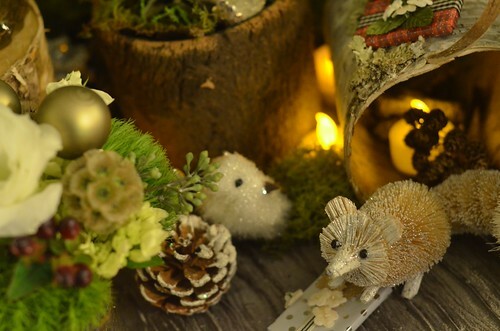 Critters climbed in the mossy scene and hid in every nook. 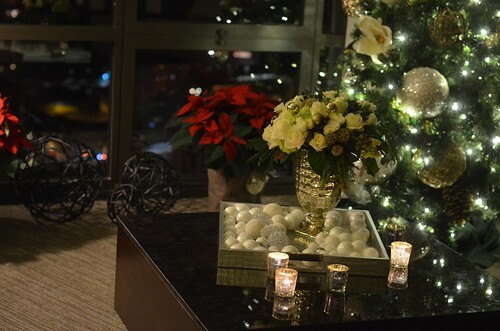 Faux votives were tucked in to add some light and warmth to the scene. 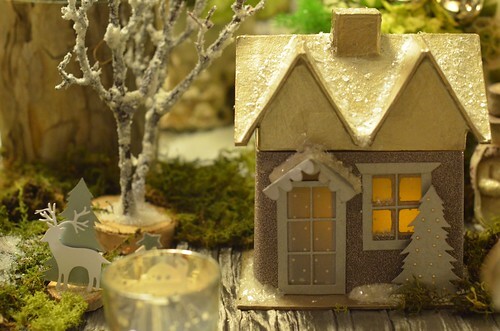 The animals had gift exchanges inside their birch dens. 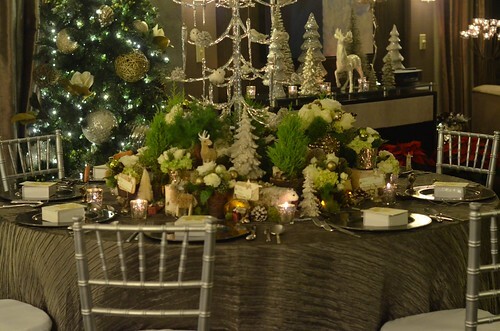 Nearly every inch of the table was filled, and there was barely enough room for the place settings! 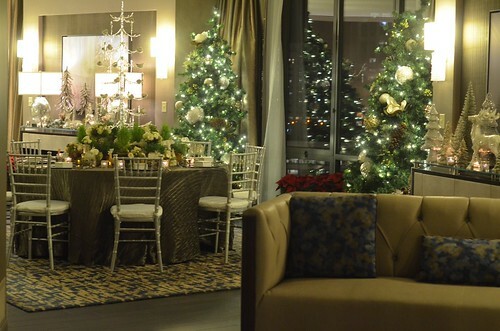 The Westin provided the decorated trees - we had four in the room. 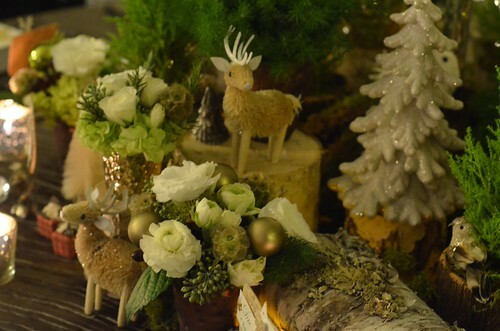 The surface of every side table, coffee table, and credenza had displays of trees, deer, birds, pine cones, and candles. 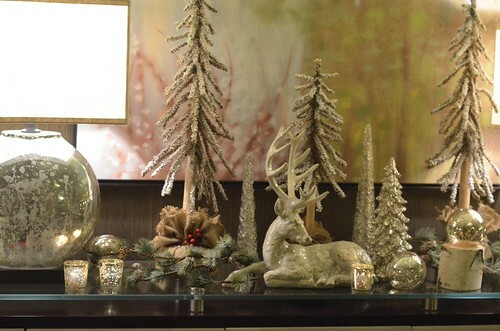 My client has a huge collection of holiday pieces, and we used them to create these vignettes. 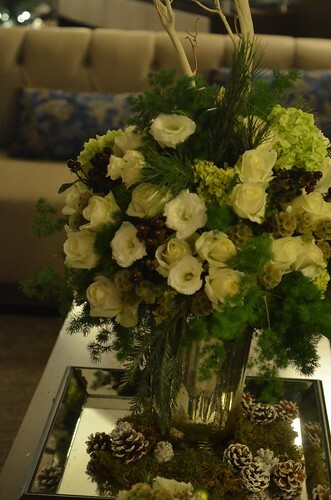 There were plenty of flower arrangements placed about the suite. And lots of poinsettias, too. 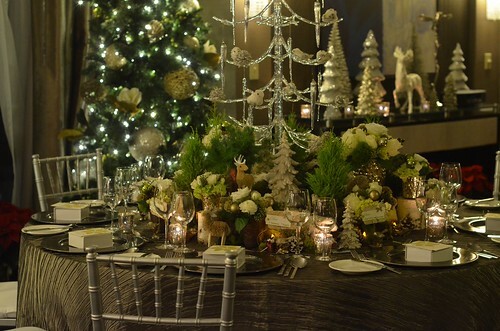 With the view and lights of the city, the beautiful design of the room, the candles, and all the decor we brought in - the room was alive and filled with holiday magic. I left just as the guests were arriving. Their faces lit up as they entered the room. 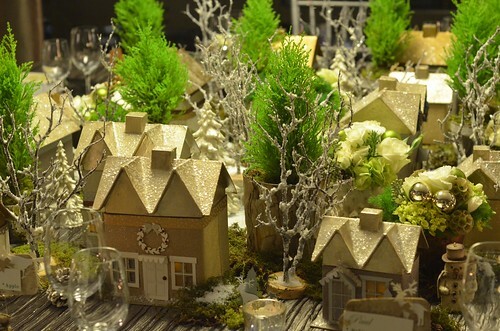 Some went straight to the windows to look at the vast view, some went straight to the dinner tables to take in the detailed scenes. It was sweet to watch them soak it all in. 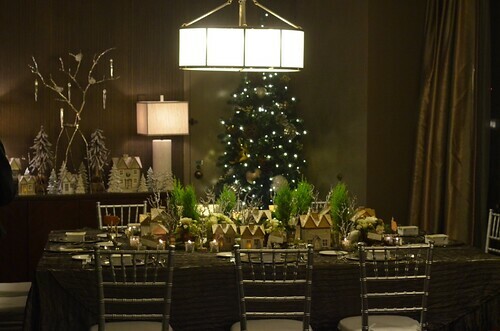 It took a lot of folks to put this all together - it all started with my client and her desire to create a magical evening for the guests. The outstanding and attentive staff at the Westin did so much to facilitate her dream. We all worked hard, and in the end, I think we created something memorable. It was a thrill to see it all come together, and I feel lucky having the opportunity to be a part of it all. If you would care to see more photos of the event, you can visit the Flickr set by clicking HERE. Wow, Laurie, this is gorgeous! 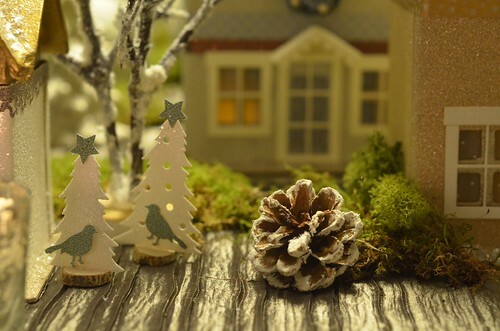 It's so festive, and the detail is amazing. Wow! This is beautiful!! I'll bet that your house is absolutely gorgeous. You have such talent and it's such a joy to see it put to use. Absolutely enchanting, Laurie. Seeing what you do for your client has become a December tradition for me. I always feel warmer, sparklier and peaceful after going through your photos and descriptions.